Homepage House	What is Scandinavian style? Scandinavia gets good press, and its decor styles are no exception. Whether we’re talking about the lifestyle, education systems, or even their social welfare, we tend to heap praise on this magnificent region. What if the well-being that we ascribe to Scandinavians comes in part from the way they decorate their interiors? Let’s discover the secrets of Scandinavian decor. Nordic trends inspire and fascinate us. Far from being a flash-in-the-pan fashion, Scandinavian style is an enduring trend thanks to its natural lines and the serenity it evokes. So much so that some home staging professionals have made it their signature style. Many emphasise the importance of “Hygge”, an untranslatable Danish word which embodies a sense of cosiness and conviviality. However in reality, the term is much more complex and interesting than its English translation suggests. A whole Danish way of life is built around Hygge, which reflects all those little moments of happiness that cannot be bought: you sit back comfortably in your chair next to the windowsill, a hot drink in hand, to watch sunset…so many cosy moments shared between you and your home (in every sense of the word). If you aim to achieve this Danish lifestyle, you should curate a serene and welcoming space where all of these ‘little moments of happiness’ can be created. In a living room, the sofa is without doubt the centre piece around which everything else is organised. Pair your sofa with a comfortable chair, placed in front or next to it. A coffee table shouldn’t be far away. To create a real Hygge atmosphere, don’t forget to include a side table made from light coloured wood. 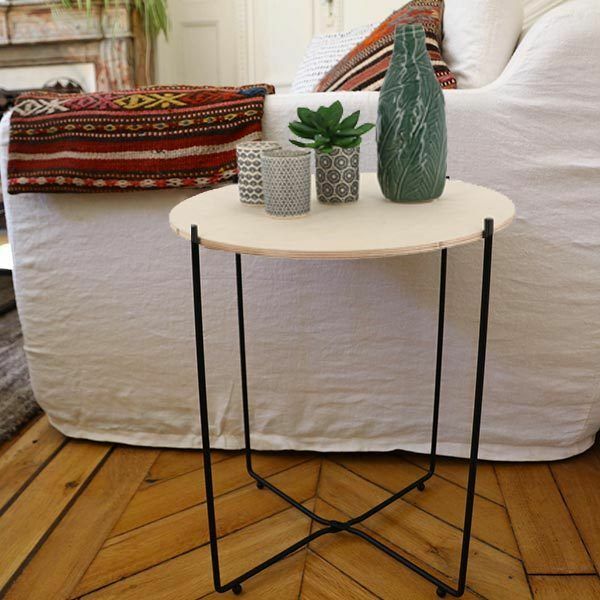 This small, round, minimalist table stands on criss-cross legs. It exudes the Scandinavian spirit of design. As for your colour scheme, neutral shades such as white, grey and pastels prevail. Include small pieces such as cushions, a candle holder or a lamp to add a splash of colour. 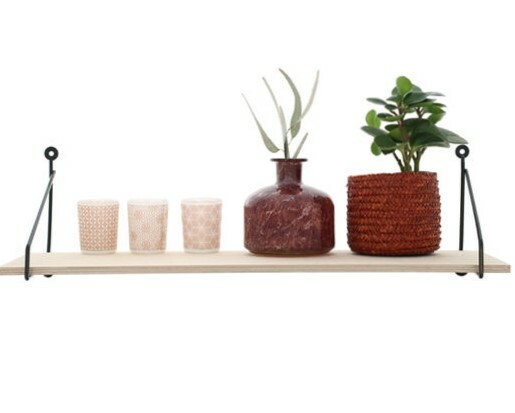 Play with small decorative accessories that fit easily into your space and any unused corners. Go for shelves that can display your everyday items or souvenirs as part of your interior decor. An orderly home will always be more pleasant to live in because it feels more spacious….A messy room will annoy you and play on your mind, which is why you have to maximise your storage solutions. Just avoid clunky, cumbersome pieces of furniture in garish colours! In the kitchen, an eclectic style is welcome! Mix and match different types and colours of chair. Just as you display your books in the living room, go ahead and show off your crockery on shelves. Pick light wood wall shelving and pair it with simple, elegant storage baskets to keep the kitchen spick and span, hiding any items you don’t want out on display. Even if you have a small kitchen, Scandinavian style can help you to create a clean space with plenty of storage, where you can take pleasure in cooking. If you want to turn your kitchen into a living area, a good trick is to install a large wooden dining table. Then add some contrast with darker decorative elements. To pull off a Scandinavian look, choose furniture with clean lines. Mix and match materials and shapes, but above all, prioritise white and soothing neutrals. Avoid red at all costs! Opt for blues and greens instead. Use a natural, stylish clothes rack to hang your garments. 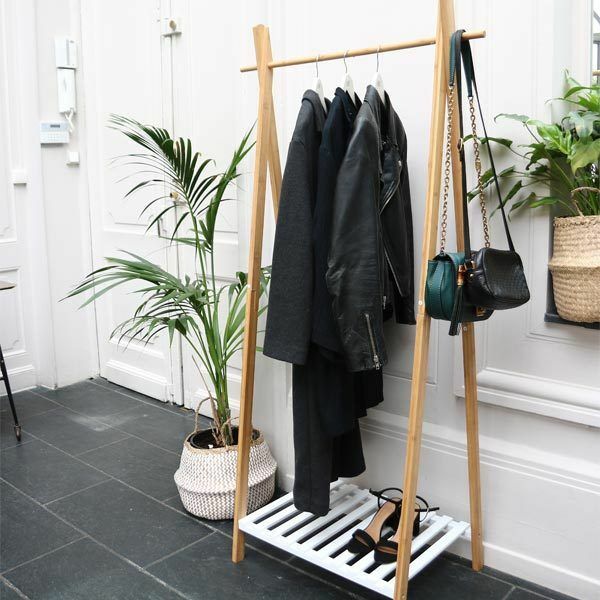 Tasteful and practical at the same time, this wooden clothes rack can be kept near a wall and moved wherever you like or whenever you buy new furniture. Note: wood is ubiquitous in Scandinavian decor, from the floor to furnishings, as well as small ornaments, etc. Get yourself a neat and tidy bathroom! Scandi style doesn’t go well with a big mess. And we already understand the positive influence of a well-organised space on our health. Begin by tucking away anything rarely used, to display the items you do use regularly. Then mix and match bright whites, smoky greys and a range of bluish hues. 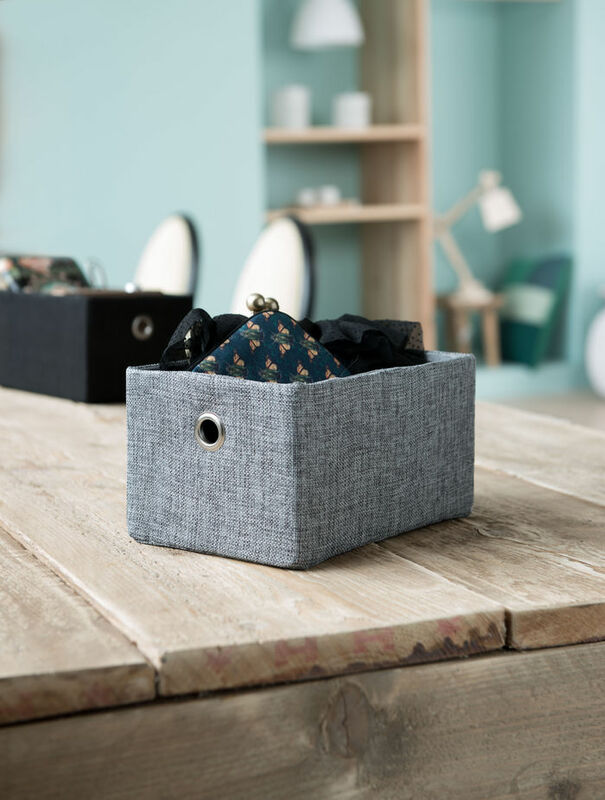 Choose neutral colours for your baskets and storage boxes. By contrasting the purity of white with the elegant grey of your York storage boxes, you can create a bright and pleasant bathroom. Combine your baskets with light wood elements and plants for a natural look. However avoid plants in the bedroom—keep them for other rooms of the house. If you need to work at home, it’s important to create a small, bright, tranquil area suitable for work. Invest in a practical wooden cabinet that fits the contours of your room (ideally, have this desk made to measure). Functionality and simplicity are the basis of a tidy work space. With concentration a must, avoid bright colours and any kind of distraction. The natural colours of both light and dark wood will help you to focus better on your work. 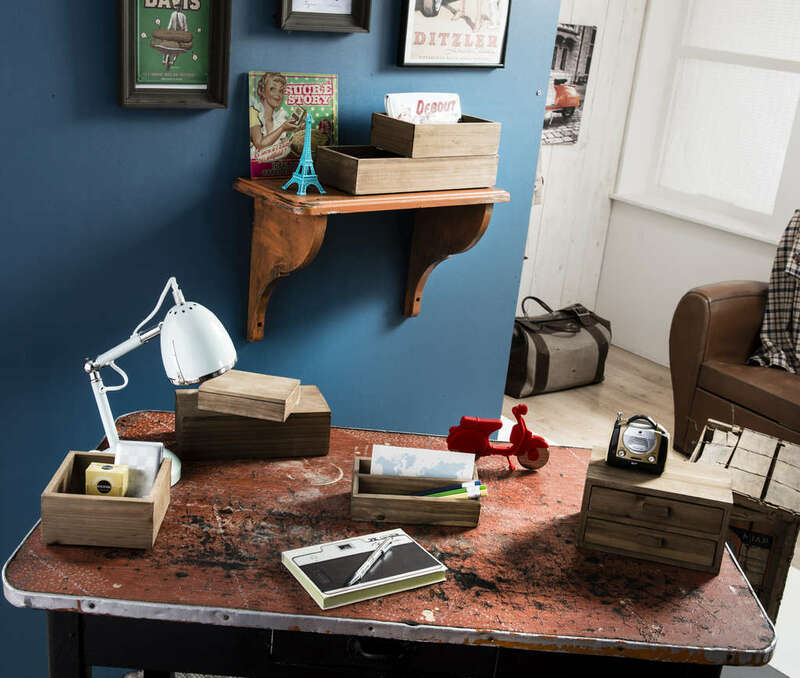 Personalise your workspace with furniture and wooden storage boxes: don’t forget that the tidier your workspace is, the more enjoyable it will be to use. Choose wooden wall mounted shelves. They’re great for some books or ornaments. Lastly, add in a few plants or cloth baskets to bring the space to life. Light and lighting is also crucial: to compensate for the absence of natural light, maximise sources of light in the room. If it’s the bedroom, use candles and lamps with warm radiance. Do the same for the bathroom and all rest areas. Go ahead and mix up the style of lamps you use, to give more variety to your decor. Whether you opt for the natural light of a candle or artificial lighting, Compactor offers a range of tealights to create a cosy atmosphere. How to pack your suitcase: 3 unique and effective methods!